Defensive lineman, pitcher… and he can sing! 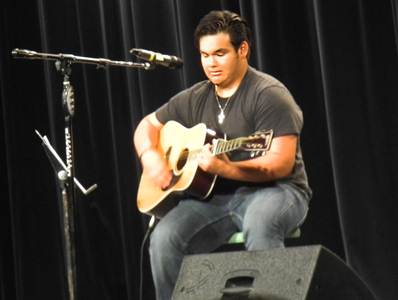 Jharyss Granger, a junior at Artesia High School and member of the Bulldog football and baseball teams, performs “Over and Over Again” by Nathan Sykes Tuesday afternoon at the high school’s annual National Honor Society Variety Show. The NHS holds the event each year as a fundraiser, and students entertain their peers with a variety of performances, from jazz combos and flag twirling to singing and guitar shredding.